All our test tags have FREE Shipping for a limited time. We have been manufacturing and printing durable electrical test tags for several years now, of which 100’s of thousands are in use Australia wide. 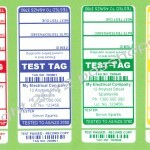 We have been selling test tag labels on eBay for many years under our name posshopptyltd-allaboutlabels and now offer them to all customers at eBay prices. All test tags are available in genric or custom printing options. Please Contact Us for more information or if you need any assistance. Need to know what colours to order? A summary guide to the Australian Standard AS/NZS 3760: 2010.